What better way to spend your bank holiday weekend at the beginning of May than stuffing it full of history! Join Matthew and Gill in Linton, just south of Cambridge, for History's Alive! See the history books spring into dynamic life on Linton’s historic Camping Close on Sunday May 4th, 11.00 – 16.00, with our exciting day out for young and old. 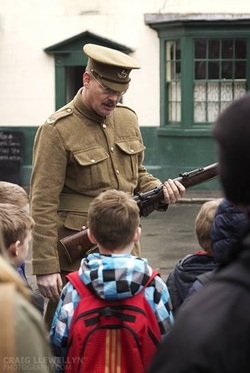 Step back in time and visit our World War 1 trench, talk to Tommy and Poilu and find out what life on the front line was like. And discover how Linton was involved. Thrill to the sights and sounds of Colonel Pulteney’s Regiment from 1745, the roar of gunfire, the smell of wood smoke. Go back to basics and be on your very best behaviour in our Victorian classroom. Relax and enjoy tea, cake and music in our vintage tea tent, provided by the fabulous Linton Kitchen. Munch on acclaimed and utterly delicious sausages and burgers from Ashcroft and Sons. There will be lots of hands-on activities for adults and children, and more attractions are being added every day! If you are interested in being a stall-holder, please contact us. This event is brought to you by HistoryNeedsYou and the award-winning Linton Children's Book Festival.